Creatine doesn't contain any special powers that'll help you slim down to a supermodel size. Instead of relying on supplements, focus your weight loss efforts on eating less and moving more. If you've added strength-training to your weight-loss plan, creatine may help you add muscle, which can give your metabolism an extra boost. Before embarking on your weight-loss journey or starting a creatine supplement, talk to your doctor about what might work best for you. Creatine is an amino acid naturally produced in your body. It's stored in your muscles and used as a source of energy for intense exercises done over short periods of time, such as lifting weights. Creatine is also found in animal protein, which means the chicken you had at lunch contributes to the amount stored in your muscle. 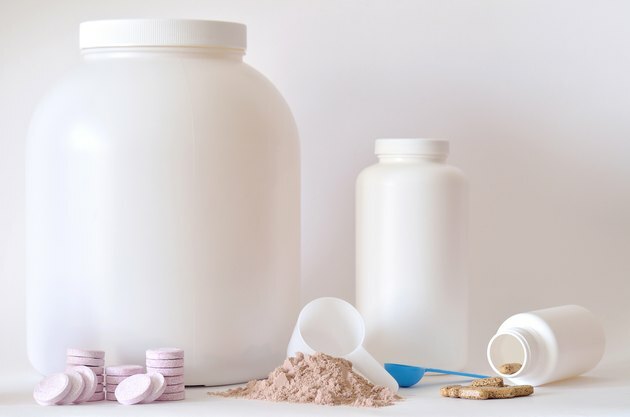 What's important to note when you're thinking about adding a creatine supplement is that your muscle is only able to store a certain of the amino acid, according to MedlinePlus. So if your creatine stores are full, taking more won't do you much good. Creatine supplements may help improve muscle growth in both younger and older women who lift weights, which may indirectly assist in your weight loss. Muscle helps your body burn more calories, which is one of the reasons why your boyfriend gets to eat more than you, because men tend to have more muscle mass than women. When you're on a weight-loss diet, you lose muscle, which means your calories needs fall, and you'll need to eat even less to continue to drop those pounds. Adding a little muscle to your frame may help limit the dip in your calorie-burning, which can benefit your weight-loss efforts. You don't have to limit your muscle-building activities to weight lifting though. Yoga, gardening, shoveling snow and body resistance exercises such as push-ups and lunges also build muscle. While the supplement may help you add calorie-burning muscle, some women may notice the number on the scale go up after taking creatine. That's because creatine supplementation causes your muscles to retain water, which may add extra weight. Because the creatine draws water from other parts of your body, it's recommended that you drink more water to help prevent dehydration. Combining creatine with caffeine may increase your risk of dehydration, according to the University of Maryland Medical Center, so in addition to drinking enough water, don't exercise in the heat while taking the supplement. Because not enough is known about the effects of creatine on babies, you should not take creatine supplements if you're pregnant or nursing. Creatine shouldn't be taken with NSAIDs, diuretics and certain other medications, and people with liver or kidney disease or high blood pressure should avoid it, warns UMMC. Building muscle is a good way to increase your calorie burning to lose weight, but you need to make changes to your diet, too. Although calorie needs vary depending on age and activity, most women can lose weight on 1,200 to 1,800 calories a day. Fill your diet with nutrient-rich, low-cal foods so you don't feel hungry. That means more fruits, vegetables, whole grains, lean sources of protein such as fish, poultry and beans and low-fat or nonfat milk. Keep calories in check by making half your plate fruits and veggies, one-quarter lean protein and one-quarter healthy whole grains. Don't skip the fat, but keep it healthy with olive oil, nuts and seeds. Is It Safe to Take Creatine if You're Over 40?